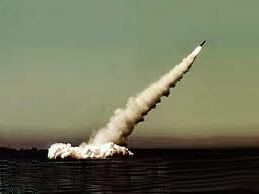 The Defence Ministry said the 12-meter-long Bulava, or Mace, which Moscow aims to make the cornerstone of its nuclear arsenal, was fired from a submarine in the Arctic White Sea and hit the target, a designated polygon, on Kamchatka peninsula in Russia's far east. "The launch was carried out from (the submarine in) submerged position in the White Sea," ministry spokesman Igor Konashenkov was quoted by state-run RIA news agency as saying. "Its warheads reached the polygon (target) on time."